I had real trouble choosing the BotW this week – because I don’t like repeating – and Gail Carriger has a new book out on Kindle TODAY and in paperback on Thursday (and my pre-order hasn’t dispatched yet – Amazon I’m watching you – you didn’t use to delay posting pre-orders to those of us who refuse to pay postage…) and if Prudence is half as good as her other stuff, it’s going to be a candidate for BotW as well. But I’ve enjoyed Timeless and the whole Parasol Protectorate series so much, it would have been disingenuous not to pick it as a BotW – especially as it was the my favourite thing I read last week. It’s my own fault for saving Timeless because I didn’t want Alexia’s story to be over. I don’t love this cover shot – although the costume is one from the book, I think the face is… odd! Timeless is the fifth and final volume in the story of Alexia Tarabotti – a preturnatural in steam punk Victorian London. And I can’t really say much more than that about the plot of Timeless because anything else would be Spoiling The Previous Four Books. 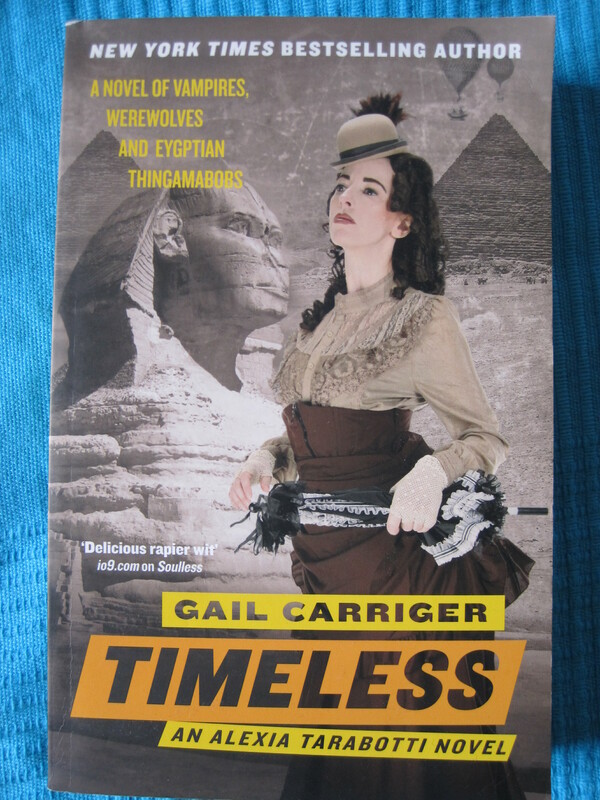 Ms Carriger was on my list of Discoveries of 2014 – and I said then that she was well on course to be on my automatic pre-order list if Timeless didn’t do something dreadful and disillusioning. And it didn’t. It’s not my favourite of the series, but it is still pretty darn fantastic and ties up a lot of the dangling threads from the previous books and then sets up a few new questions too. Alexia is a fabulous creation – and the world that she lives in is equally brilliant. Carriger has worked out how her world works and wears that very lightly – in fact she’s a big old tease. She really doesn’t want to tell you her secrets – unlike some authors who can’t wait to dump all the rules of the world on you. Even in this last book in the series we’re still discovering new things about Alexia’s abilities – and you get the feeling that Carriger has had this planned all along – none of it comes across as invented for this book. Which either means she’s brilliant at long term plotting – or she’s really good at faking it. I’ve read all the Finishing School books* that have been released so far – and I can’t wait to see how that pans out – because the world of 20 years before Alexia is very different. And I’m so excited to read Prudence and see what happened next. 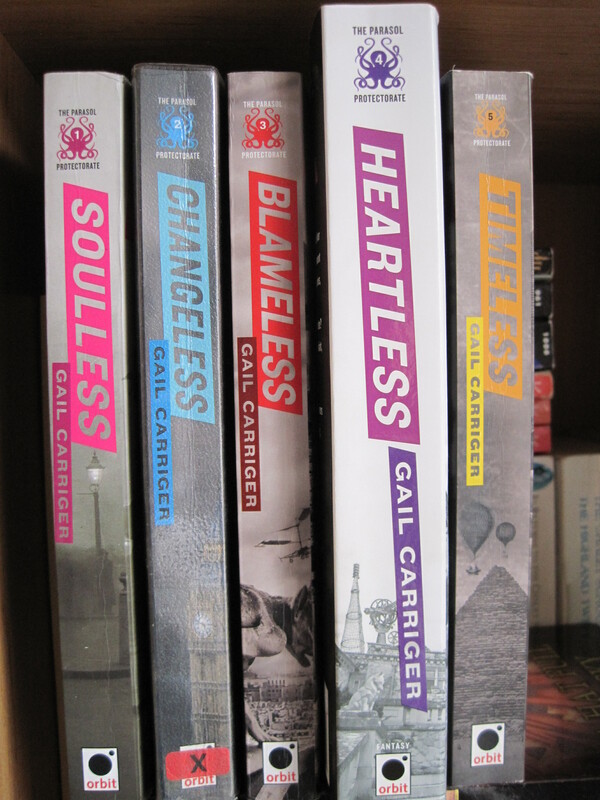 * In fact Etiquette and Espionage was my first Carriger book – thank you NetGalley for throwing that one in my path – and after I read that and Curtsies and Conspiracies and then started on The Parasol Protectorate. NB in light of the Wrong Size issue in my Parasol set, I am reading Finishing School on Kindle – and waiting til the end of the series to buy myself a matching set. What kind of crazy person am I?! 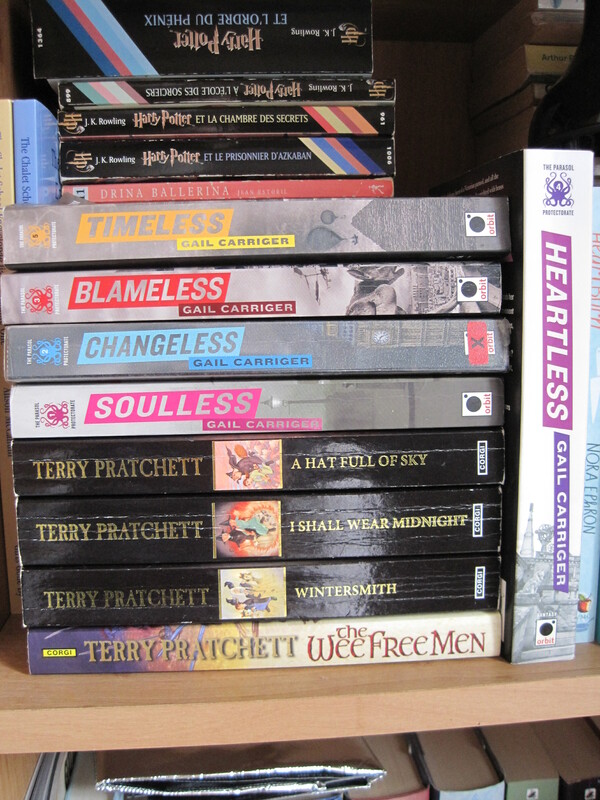 My Shelving Solution – but I cannot allow a repeat of this situation with the Finishing School books!